there are definitely some BIG current escs for cheap from china. That outrunner is pretty beefy. Magmotors are definitely a more traditional route. 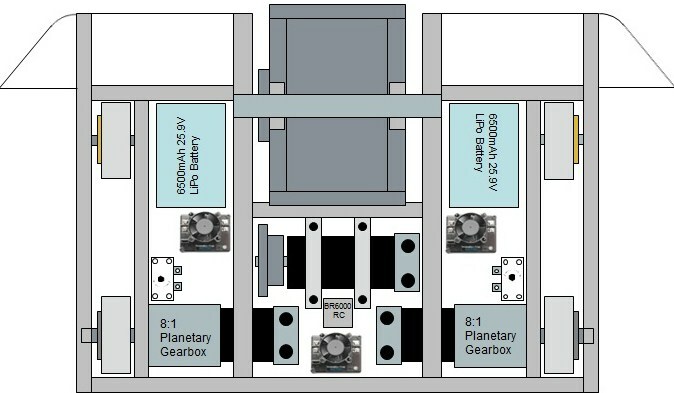 But you can't buy battlebot style magmotors from the megmotor website without knowing exactly what they are - the A28 ampflow series that robot marketplace sells are designed specifically for combat robotics and have much higher specs than the standard motors magmotor sells. keep that in mind. If you're gonna buy magmotors, buy them from rmp cause those are the legit ones. as far as sponsors go, the only company that consistently sponsored us was Witzco trailers - Josh Weinstein was our contact there. I believe his email is josh@witzco.com, but I don't remember. We machined stuff at Hydrogel the last two years I was part of the team, but that was only because that's my dad's shop. He's not gonna let the team just come in and use his shop - it was only cause I was president and designed the bot and know how to machine stuff. There's no set "rule" about how much you machine yourselves. 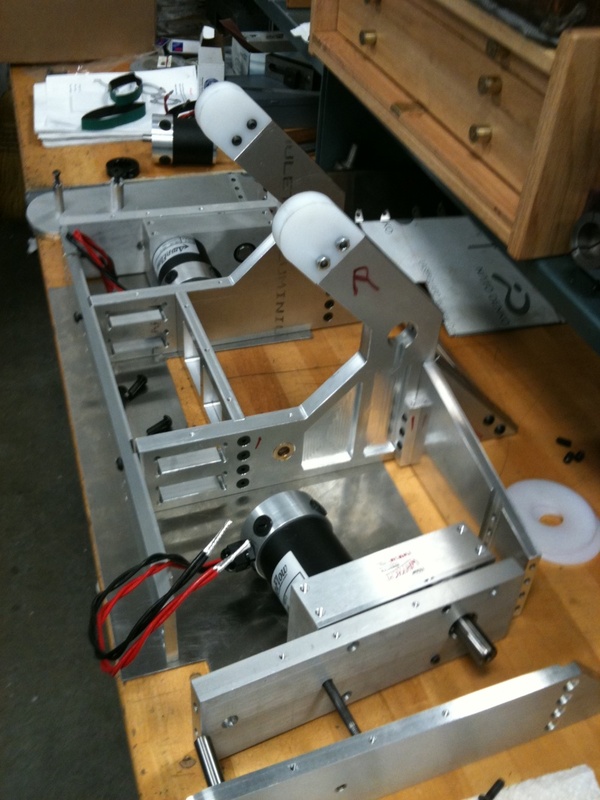 Draw up the CAD files, send them off to be machined, and put the pieces together and you're good to go. It's kind of frowned upon by the teams who do machine everything themselves, but it's perfectly legal. I agree that shopping out parts is OK, but some folks don't like it. On our team, I usually am the one to run the CNC, mostly because I don't want it screwed up. It's just too expensive to take a chance on. Typically, the students don't have time to really learn how to program it anyway. The student's DO make parts in the DRO (direct readout, not Computer controlled) mode, with supervision. I would LOVE to have one or two of them really make an effort to learn the programming, but they all want me to get the CAM software, so that they can go straight from SolidWorks to CNC. And I do want to get CAM working, but we have had so much trouble with the Tech people blocking our ability to install and alter things that it's been sitting here for 2 years UNUSED, and now we've lost the darn license! Update: A company with a very nice machine shop has agreed to machine our parts and/or teach us how to use the tools and let us do it. I plan on asking them for a significant amount of money soon, so hopefully that goes well. I'll also be meeting with possible local sponsors over the next three or four weeks. Batteries are going inside the drum. Hopefully we'll be able to use A123s. I've got the battery mount pretty well designed but I haven't yet incorporated shock mounts/neoprene or whatever so I need to figure that out. Does anyone know a good way to shock mount batteries? Would neoprene foam rubber and UHMW do the trick? No more slanted sides or back. Just a wedge on the front curving around the sides, but not right in front of the drum. Drum diameter is now at 10", wall thickness .5", length ~8 " depending on how wide the battery mount ends up being. I think we'll just cut shallow channels in the drum to put the s7 teeth in and then weld them in place. I'm thinking 30 mm hardened 4340 shaft with a small hollow in the middle for the wires to run through. so you'll be charging the batteries inside the bot? Yeah I think we'd be charging the batteries while they're inside the drum. 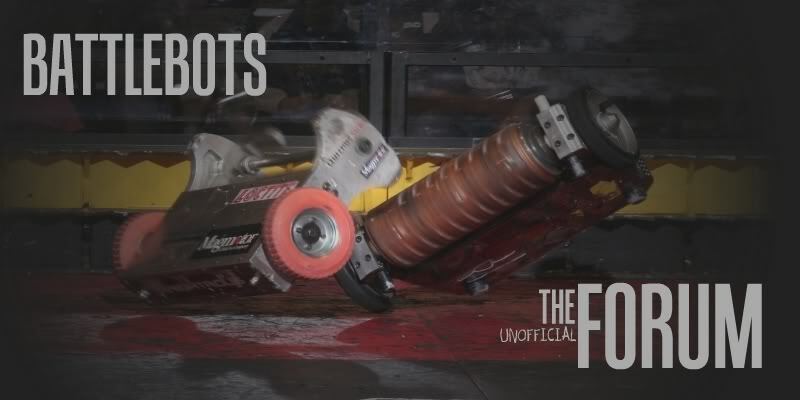 If we noticed something wrong with the bot's performance in the previous fight that indicated that some battery connection had broken, we would be able to get to the batteries but it would take 2 or 3 minutes minimum to do so. Do you know if battery balancers are needed for charging A123s? @Alex: Can you do that without decreasing the capacity of the batteries or hurting them in any way? Well...yes. We'll just have to practice and be like a nascar pit crew i guess. If we do get the money then we could have an extra set of batteries that we switch out, and that would probably take 10 minutes total, but I doubt we'll end up with extra money. We got the SolidWorks software in the mail, $500 from a local company, and all the steel and aluminum we'll need for free from them as well. 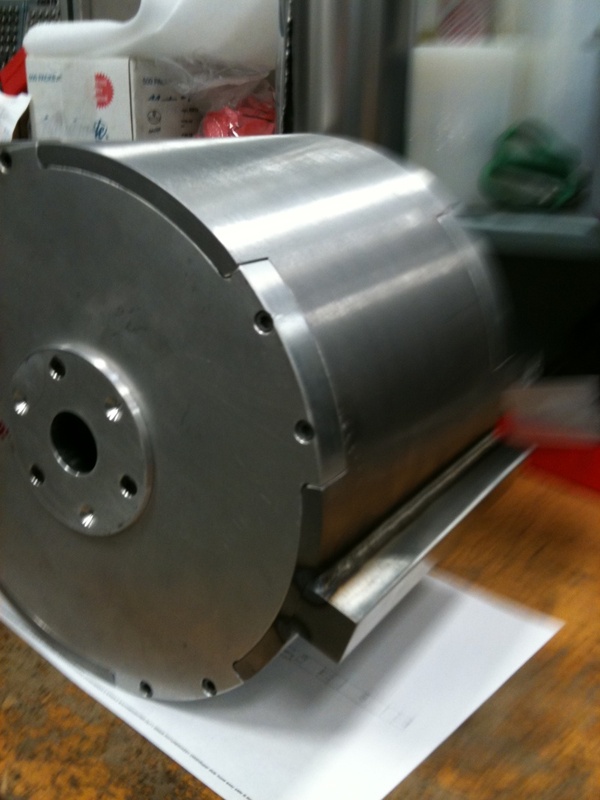 For the design, we've ditched the batteries in the drum idea for multiple reasons, and I think for the weapon we'll be using 2 A28-150 magmotors instead of the A28-400, just because it fits better in the design and we can get the drum up to a higher speed. For speed controllers, we'll probably use IFI Victor 885's because we can't find any Victor HV-36's. Does anyone happen to know roughly what the dimensions of the Victor 885 are? I can't find them online. Here's a cutaway top view. Hmmm, that looks kinda like El Gran Rey Cholo. Maybe I'll post a pic up here soon. The big cholo king? lol ok i'd like to see that. It seems a lot of robots look similar. but I admit the wedge and chassis design was inspired by K2. Looks fantastic. Should be interesting to see in operation. That looks freaking awesome! and its SHINY!